THE VICTORIAN KITCHEN GARDEN is being shown on the 'Home' Channel again !!! Without any fanfare that I'm aware of, as of the early hours of this morning, 7th March, 'Home' have been showing repeats of The Victorian Kitchen Garden. The next episode ('January') is on at 02.35-03.00 in the morning, Friday 8th March. Only episodes up to 11 - 'October' on Sun 17th at 02.50-03.15 are listed as yet. The times vary between 02.35-03.00 to 02.50-03.15, so check the listings. The VKG episodes also appear to be preceded and/or followed by one or more episodes of 'Home Front in the Garden'. 'Home' is also available +1 on Sky and Virgin. Sadly, neither series is available on 'UKTV Play', though. So, what more can I say? Today would have been Ruth's 102nd Birthday. And what better way to celebrate than with a recipe or two from her book, "Ruth Mott's Favourite Recipes"? For me, It'll be the Vegetable Casserole (page 127) followed by Baked Lemon Pudding (page 139), both requests from the family. As soon as I heard about the 3-part article on VKG by Sandra Lawrence in the gardening journal, ‘Hortus’, I set about obtaining copies. The first two parts were already in print and I reported on Sandra’s re-examination of the TV series here back in August. I’m glad to say that the third part has now been published in the ‘Autumn’ issue, number 127, and my copy has now arrived. I am not disappointed. If anything, as the articles conclusion, it is the best of the three sections, bringing out the sum of the parts as one eulogic tribute to VKG and its legacy. Sandra has cast her journalistic eye back to before 1987, comparing the state of walled kitchen gardens then, against what happened after the broadcast of 'The Victorian Kitchen Garden'. She talks about the way that the timing was crucial: VKG could not have been made now, for instance. Seminal, it is a special kind of ‘reality television’ and experimental archaeology concoction that needed a real ‘Harry Dodson’ (and not just any old Harry Dodson, either) to work the magic spell. And what a spell it was, entrancing the viewers and serious gardeners alike (so illustrating the consummate skill of the production team in the process). Not only did the garden-visiting public want to see behind those previously-closed walls, garden owners, and gardeners like Sarah Wain and Jim Buckland, themselves wanted to ‘revitalise’ walled gardens, both to delight visitors and for their own, professional, satisfaction. No-one would seriously countenance a return to the feudal system which spawned them but, in and of themselves, a working walled garden is a glorious thing. Was VKG responsible for the 1980s resurgence of walled garden and heritage-variety interest? No, not solely anyway. But without VKG would it have happened when it did and to the extent it did? Almost certainly a big fat, ‘no’. The size of the television audience made sure of that. Some of Sandra’s descriptions are as glorious as the original programme’s; her mouth “watered to taste a cardoon”, and her fingers “itched to pull a hot-bed carrot”, as she watched it all unfolding on the screen. Incisively, Sandra has hit all the salient ‘buttons’ for me. Like Jim Buckland I, too, am in thrall to that music by Paul Reade. It may be just a touch of Pavlov, as far as I’m concerned, but it seems to fit the series ambience perfectly, and that's what matters. What splendid trivia, too. Sandra describing Harry whistling while strawberry-picking to prevent the fruit being eaten reminded me of him relating his Uncle Fred saying to him, "Sciadopitys Verticillata. If you can remember that when we come back, I'll give you sixpence." Not to mention cats on running-lines, scaring the birds away. Thank you Sandra, thank you. The 1980s might have been posterity's last chance to make the VKG series but NOW is posterity's last chance to ‘shake hands’ with those who were in the 1980s walled kitchen garden revival vanguard. As one of their number confided to me last year, "I'm in my 80's, now. Catch us while you can." That says it all. Part 3 of Sandra Lawrence's article on 'The Victorian Kitchen Garden' in 'Hortus', Issue 127, Autumn, 2018. 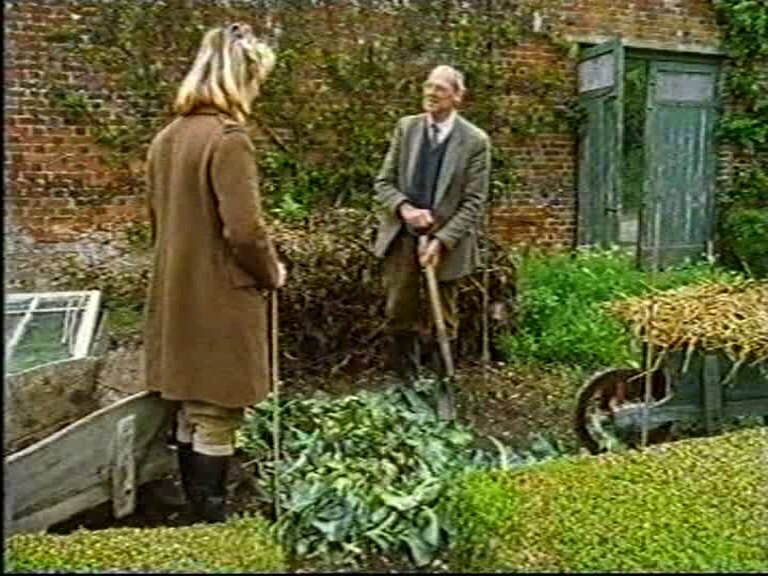 On 16th September 1987, the first ever episode of 'The Victorian Kitchen Garden' was broadcast. As it's the 31st anniversary, it's not the sort of thing you might normally take too much notice of (unless you've just remembered it's your wedding anniversary and the petrol station closes in 10 minutes). However, the multiple significances of the VKG programmes cannot be over-emphasised. They still resonate today, not only with the likes of me, but with authors such as Sandra Lawrence, whose re-examination of the series, and of the Chilton Estate where they were made, is in the throes of being published this very year. So, 31 years of my gratitude to Jennifer Davies, Harry Dodson, Peter Thoday, Keith Sheather and, later, Ruth Mott, for the legacy that means so many Walled Kitchen Gardens are now open for visitors to enjoy today. Without the likes of the VKG team, I believe that there would be nothing like as many as there are. In September 2017, I was so focussed on the 30th anniversary of 'The Victorian Kitchen Garden' series, that I forgot Harry Dodson's birthday, and had to be reminded by Jennifer Davies a few days later. Not so this year! I have made a point of remembering it this year, and I should like to think that I'll remember it next year, too. That's because Harry would have been 99 today, making 2019 his Centenary year. So, I'll be preparing over winter in order to have something 'choice' to celebrate with; maybe even one or two 'fussy pieces'. Who knows? I recently became aware that journalist and author Sandra Lawrence is having a piece about 'The Victorian Kitchen Garden' TV programmes published in 2018. It's in three parts in the gardening journal, 'Hortus' (www.hortus.co.uk). The first two parts are already out, in Issues 125 and 126 ('Spring' and 'Summer', respectively). The third part is due out in the autumn, in Issue 127. Definitely a VKG aficionado, Sandra shows a genuine love for the programmes and everyone involved, in front of and behind the camera. But she also has a realistic eye that isn't fooled by a lick of paint, or by some fanciful idea that you could turn the clock back, somehow, and all would be as it was in Chilton Gardens once more. No, she well understands that such gardens, as part of an estate, can no longer pay their way, and is grateful that those garden walls at Leverton were not swept away, as so many estates and their gardens once were, and that the spaces in and around Chilton's walls are now finding new uses and purposes within the estate once again. Sandra's canter through the the history of the Chilton Estate paints a picture of the real Chilton Estate, the high's and the low's, which all helps to show how ephemeral estate life can be. However, the personal recollections of the custodians of Chilton, the Wards and now the Scropes, bring a bit of Harry Dodson's world back into focus, as does the retelling of the thread of the TV series. What Sandra, like many of us, is also grateful for is the perseverance that meant the VKG programmes were made, when they were, and with the people who appeared in them. They captured the last of those old skills and ways, learned by Harry from his Victorian mentors, and used by him early in his career. 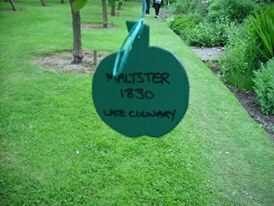 Where was the interest in walled gardens, and in what we now call 'heritage' varieties, before 1987? Sandra is in no doubt as to the vital part played by VKG in the revival of both. I now have the long wait 'til the arrival of the Autumn issue and part 3 of Sandra's piece, where that legacy of VKG will be explored. It is six years ago today since 'Auntie' Ruth Mott passed away. Almost more difficult to believe is that it was 13 years ago, on 25th July, since Harry Dodson died. Both still loved by fans of 'The Victorian Kitchen Garden', 'The Victorian Kitchen', 'The Victorian Flower Garden' and 'The Wartime Kitchen And Garden'. Time to get the DVD's out, put the kettle on and break open a new packet of biscuits, ready for a quiet evening in. Hard to believe, but it's a year since the interment of the late Harry Dodson's remains, on 19th June, 2017. Some of you may remember that there were no instructions available at the time of his death in 2005, as to where Harry's remains were to be interred. The document containing Harry's wishes only came to light after the death of his wife, Jane, in 2016. So, Harry’s ashes remained with the undertaker until last year when they were placed in his mother’s grave at St Matthew’s Church, Blackmoor. Harry had been brought up on the Earl of Selborne’s Blackmoor Estate, of course. I also put a few more pictures on last years post. Ralph Thoday and ‘Home Grown’ – 65th Anniversary ! In my rush to get the WTKG 25th Anniversary post sorted, I forgot to mention a ‘nearly-coincidence’. It’s only a bit of a tortuous connection so, stay with me people. As well as 5th November 2018 being the 25th Anniversary of ‘The Wartime Kitchen and Garden’, the 8th November marks the 65th Anniversary of an episode from 1953 of ‘Home Grown’, a radio gardening programme on the BBC ‘Home Service’ (Radio 4 to any youngsters). “What’s the fuss?” I hear you say. Well, one of the guests, giving advice on the storing of fruits and vegetables, was none other than Ralph Thoday, Head Gardener at St. John’s College, Cambridge, at the time, and the father of Peter Thoday. Another of the illustrious contributors was Fred Streeter, famously Head Gardener at Petworth House, turned radio personality. 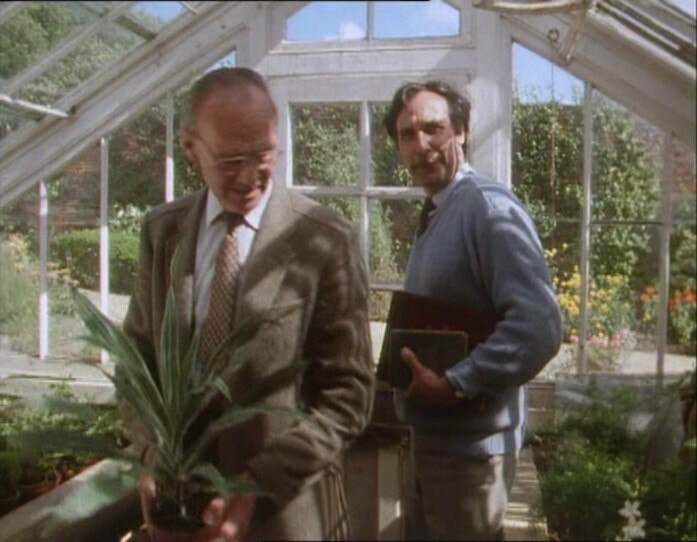 And, thinking about it, this would have also been around the same time that Peter began his horticultural career, studying at Cambridge Botanic Gardens. In a slight fixation with gearing-up for the 30th anniversary of the first broadcast of ‘The Victorian Kitchen’ series next year, 2019, I had completely overlooked (to my eternal shame) another associated anniversary. As remarkable as the others, ‘The Wartime Kitchen and Garden’ series was the fourth of the trilogy (as Douglas Adams might have put it) from the team who brought us the ever-enjoyable, ‘The Victorian Kitchen Garden’ (VKG) programmes. At 8:30 on the evening of Friday, 5th November 1993, the first episode of WTKG aired on BBC Two and I, for one, will be marking the day with a bit of WTKG over-indulgence (and possibly a few fireworks, given the date). The series, another brain-child of Jennifer Davies, brought together the perfect on-screen double-act of Harry Dodson and Ruth Mott again, backed-up by much of the old production team, including narration by Peter Thoday. New faces, though, included Anya Medlin as ‘Land Girl’ Annie, and ‘evacuees’ Joyce and Paul (Tracey and Paul Godsmark). I’m always hopeful that there will be some acknowledgement, at least, of these anniversaries by the BBC, or whoever, really. I’d just like to see the programmes and the team behind them publicly applauded for the fantastic legacy they gave us. A re-run would be lovely; a ‘special’ would be absolutely fantastic. And if the 50th Anniversary of ‘Dad’s Army’ can get the coverage it is getting this summer, including commemorative stamps from Royal Mail, surely there’s a bit of room somewhere for WTKG? Now, who’s up for dropping a line/text/tweet/email to the BBC/Radio Times/UKTV (they have the TV rights)/Acorn DVD (who still make and sell the DVD’s of three of the series), and anyone else for that matter, reminding them it’s high-time for a bit of acknowledgement of the VKG and WTKG programmes? Form an orderly queue and have your Ration Books ready . . .
Ruth and Joyce making an (amusing) leek pie. Harry and Annie making a far more serious compost heap.